History, fun facts and reviews of every theatrical Disney film in chronological order. Follow along as I review over 70 years of Disney movies. It must have come as a surprise to movie goers in 1964 that Walt Disney would follow the success of his crowning achievement Mary Poppins with an international film made from the same mold as Almost Angels and Miracle of the White Stallions. The film is based on a worldwide bestseller by Erich Kastner from 1929 of the same name that would have been familiar to US audiences at the time. It had also been adapted for the screen 3 times before Disney made his version. The screenplay was written by AJ Carothers, who also adapted White Stallions. Peter Tewksbury was hired to direct his only Disney film after a successful track record directed TV comedies, including Fred MacMurray on My Three Sons. American star Walter Slezak was cast to headline the film as the villain, his first and only Disney role. American child actor Bryan Russell plays Emil, who had a small role in Babes in Toyland and would spend most of his short lived career at Disney. Roger Mobley who plays Gustav also had a good career at Disney, mostly in TV movies for The Wonderful World of Color. The rest of the American actors were mostly children who had only acted on TV before mixed with many German actors. Filming was done on location in Berlin and at Filmstudio Tempelhof. The film opens with animated credits featuring three burglars. A narrator then introduces us to Emil, who is boarding a bus to visit his grandmother with an envelope of money for her safety pinned inside his blazer. However, he is being followed by a thief and when he wakes up from his nap, the envelope is gone. He chases after the man who was sitting next to him and tries to get the police to help, but because Emil didn't see him take the money the police won't help him. He meets a young boy named Gustav, a young detective who agrees to help him track down the thief. Gustav calls on his friends to play detectives too. He gets a tip that the thief will be at a hotel and the kids station themselves to try and catch him. They learn that there are three crooks that they call "skinks" and they are planning to build underground tunnels. They follow them through a dilapidated building under which they are digging their tunnels. The skinks realize they are being followed and catch Emil. The tunnels they are digging lead to banks they intend to rob. Meanwhile, the other kids have been helping the police identify the skinks. They see the leader and one of his men walking with stolen money in a basket and tell all of the kids nearby that they are giving away free money. The men are swarmed by the kids who chase after them. Meanwhile, Gustav and Emil's cousin Pony lead the cops to the tunnels where they rescue Emil and catch one of the skinks. The cops show up just in time to arrest the rest of the skrinks and Emil get reward money for their capture, which he shares with Gustav and the detectives. 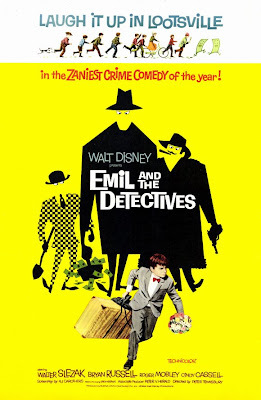 Emil and the Detectives opened on December 18th, 1964 as Disney's big Christmas release. Critics enjoyed the film and praised it for having realistic kids that didn't mug the camera and weren't annoying. However, it was not a big success at the box office. It made its TV debut in 1966 and was released on home video in 1987. It's a shame that more people today haven't heard of or seen this film. The plot is amusing and the child actors all do fine jobs. Especially Roger Mobley as Gustav, a character who in less capable hands would have come off as annoying. There is also some depth to the character in that he seems to be a loner, almost like Dodger in Oliver Twist. And while the other detectives talk about their families at some point, he brushes questions about them away. It makes me curious if his character in the book wasn't an orphan. I've never seen any of the other film versions, but other reviewers claim the original 1931 German version is the best. However Disney's version adds the subplot about the tunnels which appears to be missing from all other versions from what I've read. If you're a fan of Disney films from the 1960's, I recommend this film. 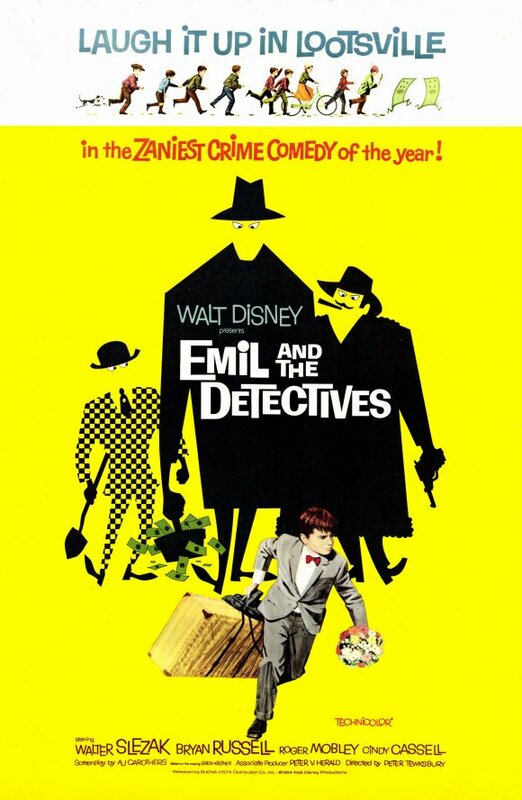 Emil and the Detectives is currently available on DVD as a Disney Movie Club Exclusive. It appears that a recent restoration was done, since the film looks much better than most Disney films from this era. The film is presented in fullscreen, although it was originally released in widescreen, most likely 1.75:1. There aren't any bonus features. The film is also available on iTunes, where it is correctly presented in widescreen and can be purchased in HD. Wow, I had never even heard of this Disney film. Thanks for the review! Been wondering about this since I fell asleep at christmas with entire family in 64. Now ill see the whole of it. Excited to find.